TIGERLIM.COM: "I tawt I taw a puddy tat!" Yes... I did, I did taw a puddy tat!!!! 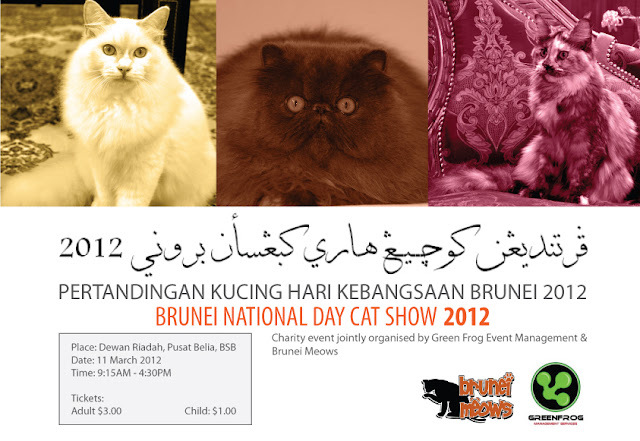 Bruther... this is a good news for all the Cat Lover kaki to participate this event. ONE WEEK before the show date. 2. Pedigree Certificate from CFA or any other recognized international cat fancy. www.facebook.com/brunei.meows stating your contact details. Closing date for submission of entries is 4 March 2012. Tabung Kebangsaan of the Ministry of Culture, Youth and Sports. your wonderful, loveable felines at the show.